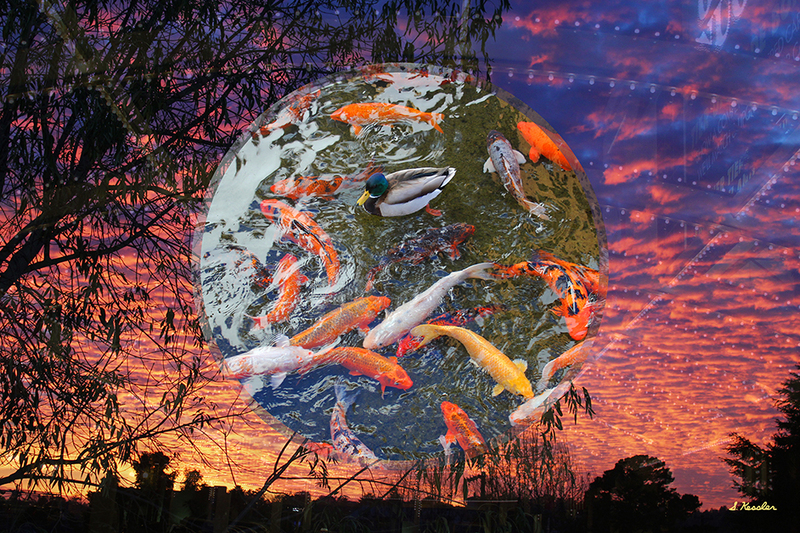 I’m very excited and honored to have my digital photo collage accepted into “Planet Pulse – A National Art Exhibit” at the Santa Cruz Art League! 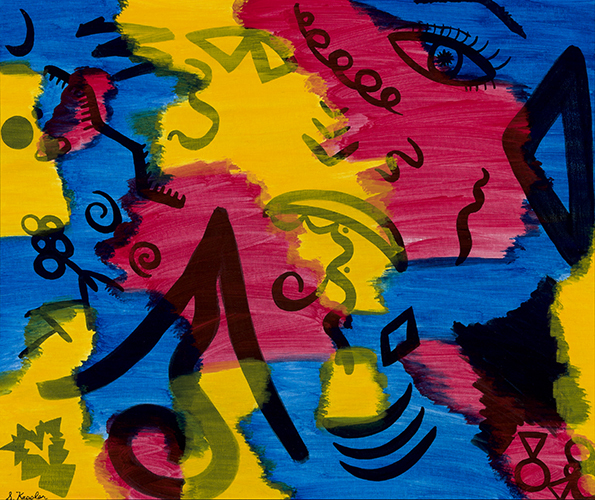 The exhibit runs from Aug. 10 to Sept. 9, 2018 with a 1st Friday Reception on September 7th from 6:00 pm – 8:00 pm where you can meet the artists! The address is: 526 Broadway, Santa Cruz, CA. If you’re in the area, I hope you’ll stop by and check it out! 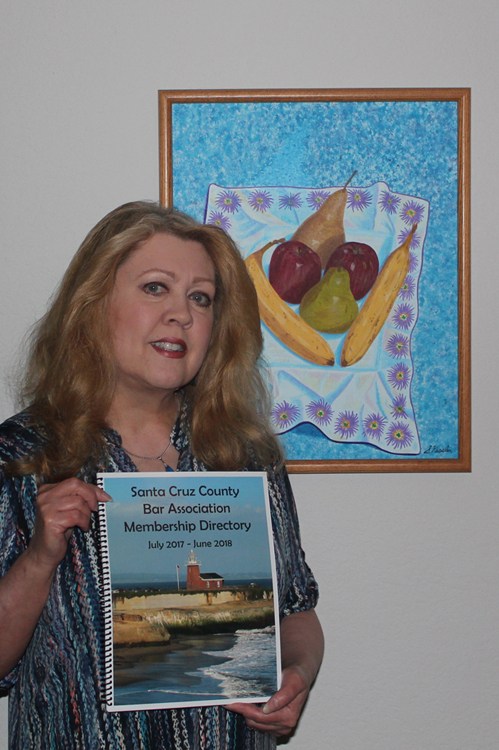 I’m very proud and honored to have one of my photographs chosen for the Santa Cruz County Bar Association’s Membership Directory! This makes it five years in a row! You can see a clearer picture of “Santa Cruz Boat on Wharf” on the “Photographs” page of this website. I sure love Santa Cruz! We recently came back from Maui, Hawaii and I have to say, although it was beautiful in many ways, the weather was hot and humid. It was so refreshing to come back home to our cooler temperatures. Not that we don’t have hot weather here sometimes, but usually it’s pretty nice. In Hawaii, every time I walked out the door, I felt like I was walking into an oven. And even though they had a beautiful rain forest (that was still hot and humid), they didn’t have our redwood trees. I heard there were some redwoods around, but not like here! So overall, I’m really glad I get to live here in such a beautiful place! And with my photographs and photo collages, I get to share my experience with all of you! 1st Friday at Santa Cruz Coffee Roasting Co.
Wow! I’m so honored to let you know that you’re all invited to 1st Friday (April 6th) at the Santa Cruz Coffee Roasting Co. 1330 Pacific Ave, Santa Cruz, CA from 6:30 – 8:30 pm! My Santa Cruz inspired photo collage exhibit runs through the end of April 2018. If you’re in the area, I hope you’ll stop by! Welcome into my imagination! Of course, you can always see more of my work at www.susankessler.net. Hope to see you there! Solo Exhibit at the Santa Cruz Coffee Roasting Co. Welcome into my imagination on display at the Santa Cruz Coffee Roasting Co., 1330 Pacific Ave., Santa Cruz, CA where my digital photo collages offer you a new way to view beautiful Santa Cruz County! The exhibit will be there for March and April 2018. I am so honored and thankful for this opportunity to have a solo show there. If you’re in the area, I hope you’ll stop by. Let’s hope that this rain we’re having right now, will help bring lots of beautiful flowers this spring! 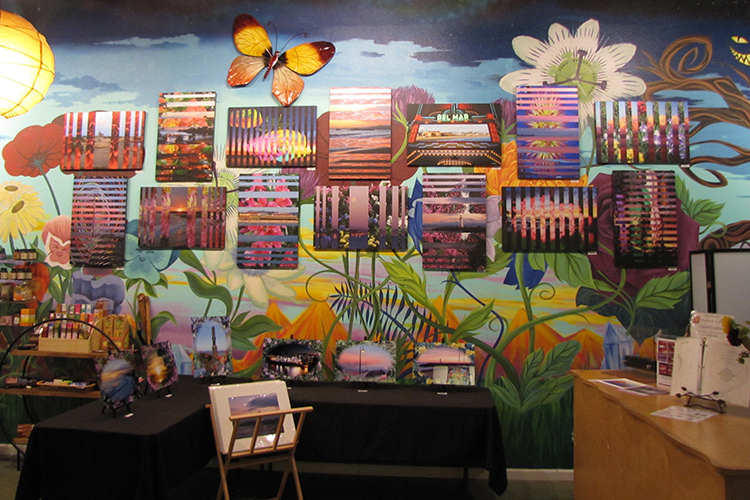 See “Floral Abbott Lighthouse” at the Santa Cruz Art League! 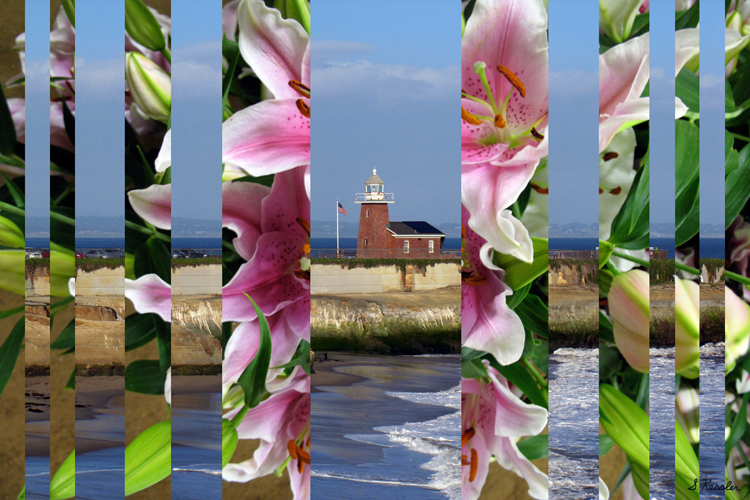 You’re all invited to check out the Member’s Exhibition A-L at the Santa Cruz Art League, where my photo collage “Floral Abbott Lighthouse” will be on display at 526 Broadway, Santa Cruz, CA now through March 10, 2018! There will be a reception on 1st Friday, March 2nd from 6:00 – 8:00 pm and I hope that if you’re in the area, you’ll stop by and enjoy viewing the works of many great artists in our area. 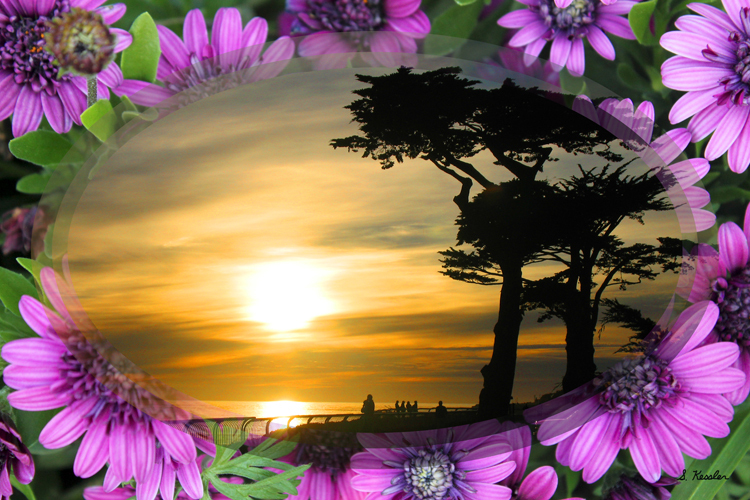 My photo collages are inspired by living here in beautiful Santa Cruz. Lately, our weather has been pretty warm for February and really nice, but we do need some rain to avoid another drought! I hope wherever you live, you’re enjoying some nice weather right now. It’s always fun to check out what’s happening in the art world, rain or shine! Stay tuned for a special announcement of a new exhibition of my work, coming soon! Have a great day! First of all, I just want to wish everyone a very happy holiday season! A lot has happened this last year, including me spraining both of my ankles back in May. It’s a long story, and I’m still not completely healed, but I am able to get around pretty good now. Because of my sprained ankles, I haven’t been able to take as many photographs this year as I would have liked. However, I already had some photo collages that I hadn’t posted yet, so here’s a new one for you. It’s called “Flowered Abbott Lighthouse”. The picture of the lighthouse was taken back in 2009, when there was a dedication ceremony honoring a plaque of the three Hawaiian princes, that introduced surfing to the United States in 1883, right here in Santa Cruz, CA. 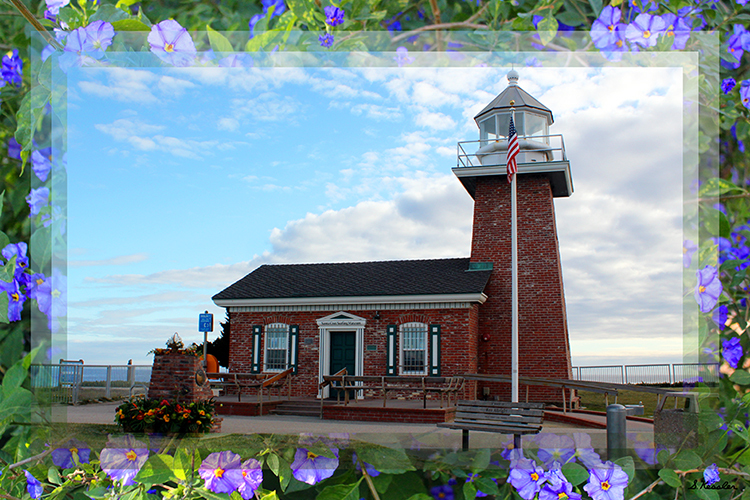 You can see the pretty flowers surrounding the brick enclosure holding the plaque, which is facing the lighthouse. 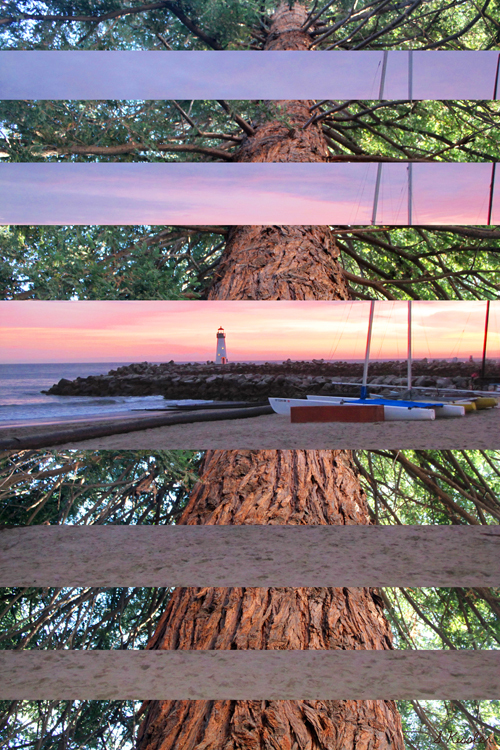 This Santa Cruz photo collage is also cut different than the others. Stay tuned, there’s more to come! Again, Happy Holidays! 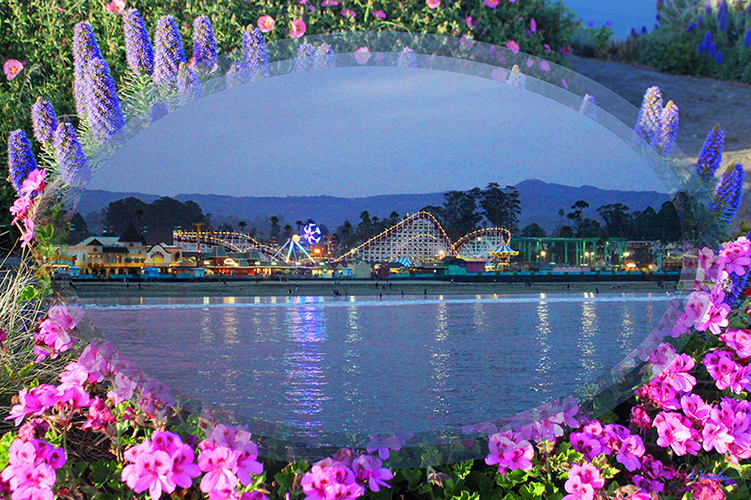 I wanted to let you know that you’re all invited to 1st Friday at “Go Ask Alice”, 1125 Pacific Ave., Santa Cruz, CA, where I’m so honored to be showing my Santa Cruz inspired photo collages and matted photography prints. They will be on display Sept. 1 – 25, 2017. If you’re in the area, I hope you’ll stop by and check it out. It’s beginning to feel a lot like Fall, and it will be here before we know it. Most of our tourists are gone now, so Santa Cruz is starting to get back to (our way) of normal. Enjoy this time of year, but let’s not forget that the people of Houston, Texas are not so fortunate right now. I’m sure we all wish them well and hopefully some of us can make donations to help them out, through the Red Cross. Take care everyone. 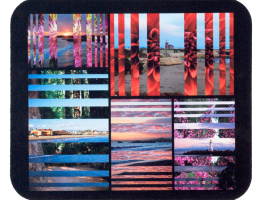 I’m so excited and honored to have this photo collage chosen to be in the juried art exhibition “Science, Technology & The Future of Art” Aug. 4th (1st Friday 5:30 to 8pm) through Aug. 24th at the Pacific Art League, 668 Ramona St., Palo Alto, CA. Hours M-F 9am – 5pm. If you’re in the area, I hope you’ll stop by and see it in person. Keep checking back here for more updates on future shows and of course new art! 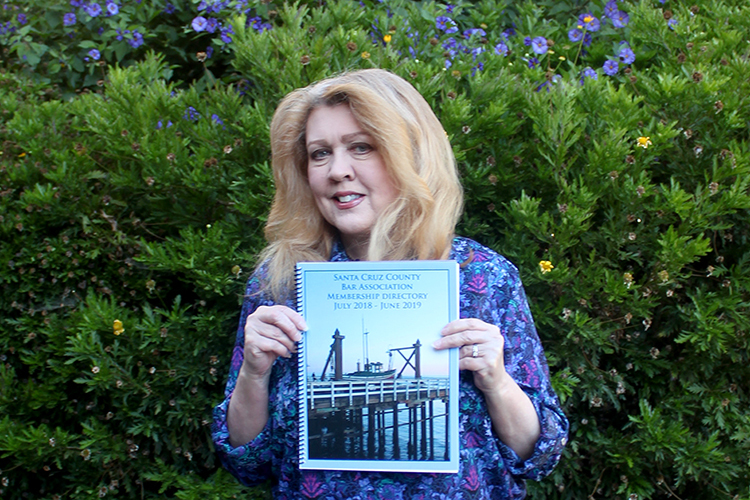 Once again I’m so honored to have one of my photographs featured on the cover of the Santa Cruz County Bar Association’s Membership Directory, for the fourth year in a row. It really is quite an honor! I sure love this town and am so grateful to be able share the beauty of it with all of you, in my photographs and photo collages. Have a nice, fun summer everyone!